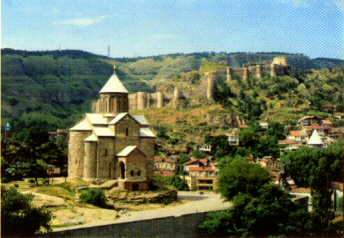 In Mtskheta, King Vakhtang let his hawk loose one day and it chased after a pheasant. The King waited. He could not see the hawk, nor the pheasant. He Followed the path that the hawk had, taken down the valley. At the bottom of the valley flowed steaming waters, the colour of sulphur. The pheasant had drowned and the hawk sat above. Enchanted with the source of the hot waters, the King founded Tbilisi in the valley' (Tbili' means warm in Georgian). A blend of cultures, a smell of spices on the air, different nations meeting on street corners, different faiths sharing the same courtyards, ...this is Tbilisi, the city that has been dominated by traders, warriors, tyrants and dictators in turn. Take a walk around the old town, and breathe in the living past. Visit the bustling markets, the ancient sulphur baths, the dazzling treasury, and the magnificent churches, and gain a sense of the crossing place of the Caucasus. 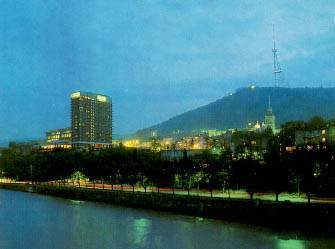 Tbilisi - It is a town which conquers you with a slow fascination and lodges in your heart forever.